Researchers sent a detergent solution through the leaves' veins to remove plant cells. Sometimes the answer to a scientific quandary can be found just down the aisle—the produce aisle. Researchers attempting to scale up human tissue regeneration from small samples to full-size organs face a big obstacle: how to establish a vascular system that delivers blood deep into the developing tissue. 3-D printing can't yet create the branching network of blood vessels required to deliver all the essential oxygen, nutrients and molecules. So a team of researchers from Worcester Polytechnic Institute, the University of Wisconsin at Madison and Arkansas State University at Jonesboro looked to the plant kingdom and found . . . spinach leaves. 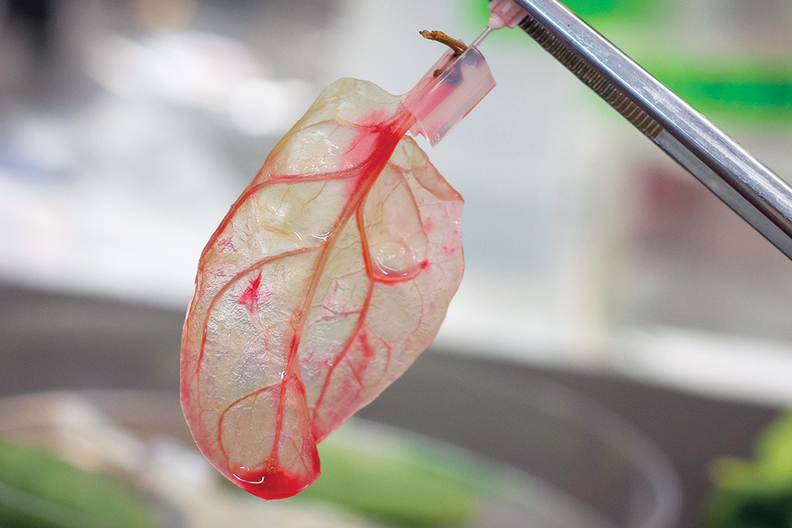 The researchers cultured human heart cells onto spinach leaves that had been stripped of plant cells, leaving just a framework consisting mostly of cellulose. They flowed fluids and microbeads similar in size to human blood cells through the spinach leaf's vascular system, and they seeded the spinach veins with the human cells that line blood vessels. Having succeeded in proving the concept was viable, researchers hope this study could open the door to using spinach leaves to grow layers of healthy human heart muscle that could be used to treat heart attack patients. Other decullarized plants could provide a similar vascular framework. "We have a lot more work to do, but so far this is very promising," said Glenn Gaudette, a professor of biomedical engineering at WPI. "Adapting abundant plants that farmers have been cultivating for thousands of years for use in tissue engineering could solve a host of problems limiting the field."